Last week’s game between Kildare and Mayo gave us a glimpse of the “what might be” with high scoring and excellent shooting. The fare in Mullingar was more along the lines of what we expect in the league. Whilst Dublin had a lot of possession (49 possessions was the highest recorded in the 25 2013 Championship games covered – as it happens by Dublin against Westmeath!) they were poor at converting that possession into shots. If they were only meeting the average they should have had 38 shots – in the aforementioned Championship game they had 42. The Success Rates were below average as well. The refrain will be that “it’s only the league” however it is generally the league where you want your squad depth, your second rank of players, to put their hand up and make a push for a place in the Summer. McManamon & O’Gara are probably in Dublin’s second rank of forwards (Flynn, Kilkenny, Connolly, Mannion, B Brogan & Andrews being the nominal starting six with O’Gara, McManamon, A Brogan & Rock pushing for a starters role) however combined they converted one of eight shots. They weren’t necessarily difficult shots either with five of the eight occurring inside the 20m line. 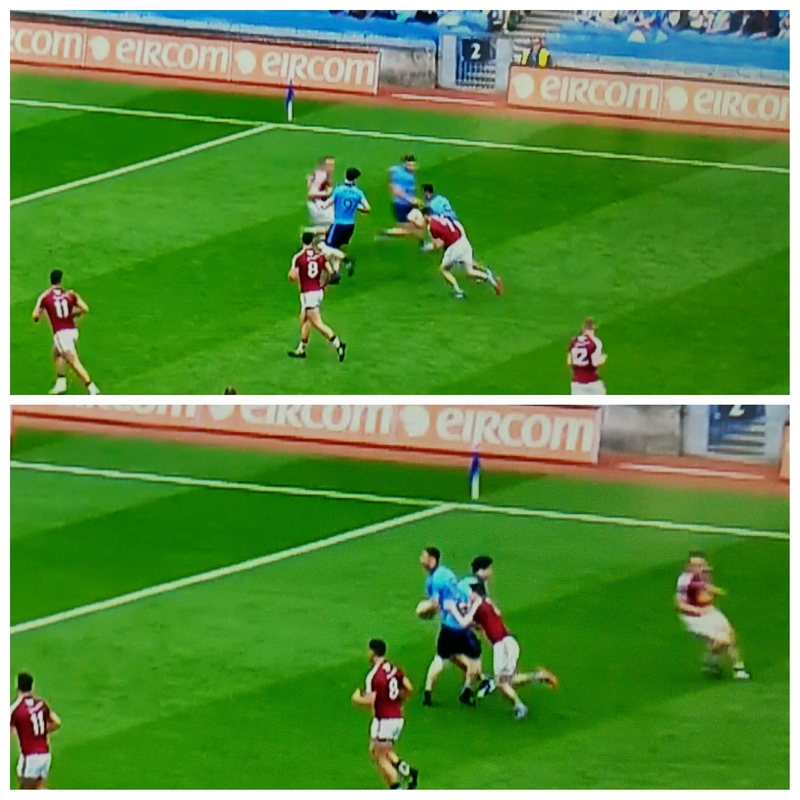 As an aside neither Mannion nor Kilkenny attempted a shot from play. For all Dublin’s struggles they put themselves in a position to win. Westmeath were unable to get enough ball to stick up front. With only 27 possessions their Shot Rate and Success Rate would have to have been excellent to put enough scores on the board. Neither were. A mixed bag. Mannion missed two very, very simple frees and whilst Kilkenny’s Success Rate was 75% his negative weighting tells you that the one he missed was a sitter. To offset those poor displays Heslin’s striking was excellent particularly the monster free he converted from outside the 45m line in the first half. Then there was Cluxton. Dublin, as is their wont, were just too strong for Westmeath in this facet of the game. A lot of focus is given to how Dublin use their own kickouts and again they were very good in this game securing possession on 80% of their kickouts and only coughing up a shot to Westmeath from one of their 15 kickouts. On top of this Dublin hemmed in Westmeath on their kickouts. 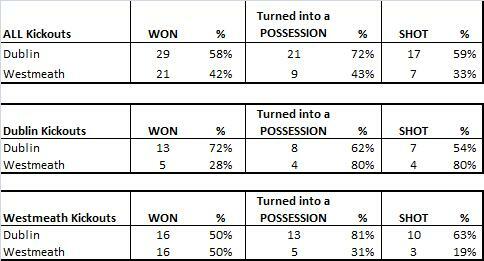 Not only did they win ball on more of Westmeath’s kickouts than Westmeath (15 to 13) did they also stopped Westmeath from using what kickout possession they did win to launch attacks. 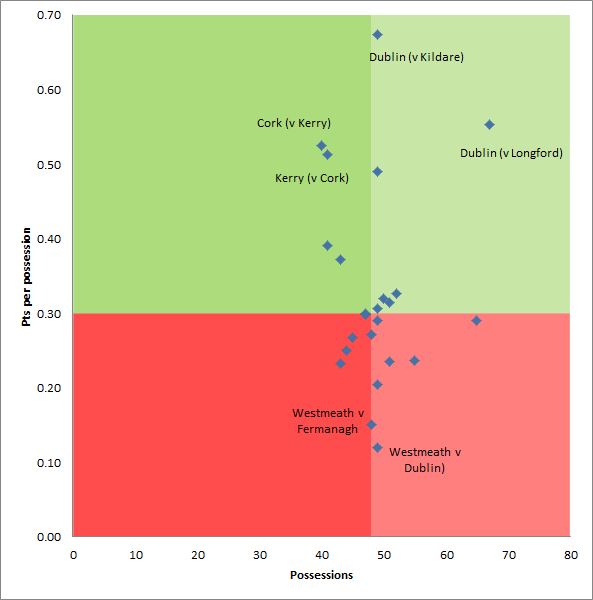 Westmeath only got a shot from 31% of their own kickouts that they won – Dublin’s return was 67% from theirs. Following Kerry-Tipperary this is another game where one team was utterly dominant. Prior to Westmeath taking their first shot from play in the 23rd minute Dublin had taken 16 shots. 15 of those shots were from play with only 5 coming under any form of pressure. 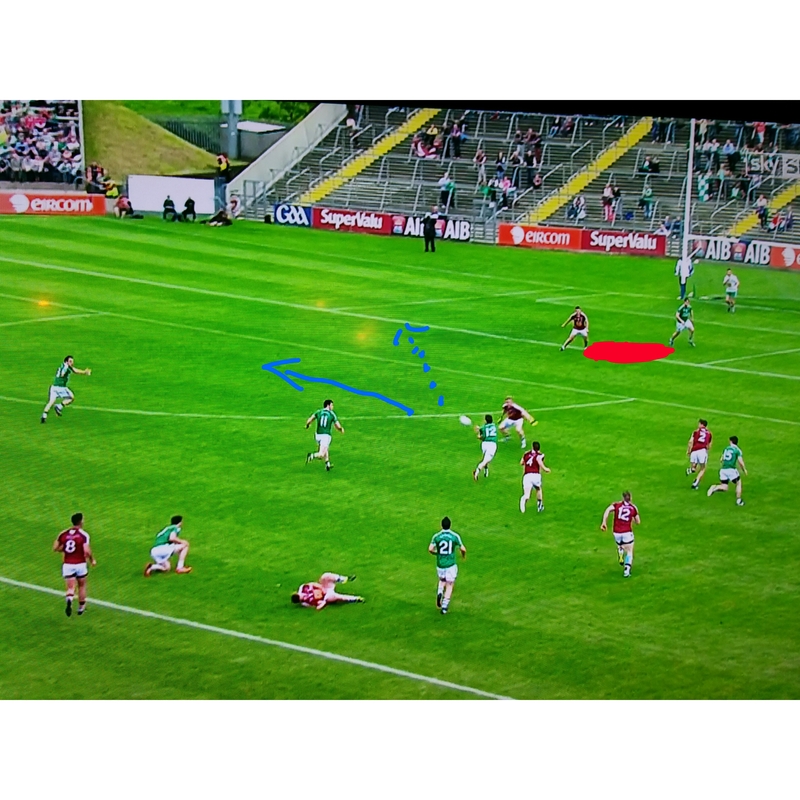 This lack of pressure was not due to Westmeath tactical naivety; they effectively had 12 behind the ball. It was more due to the precision of Dublin’s attacking play. 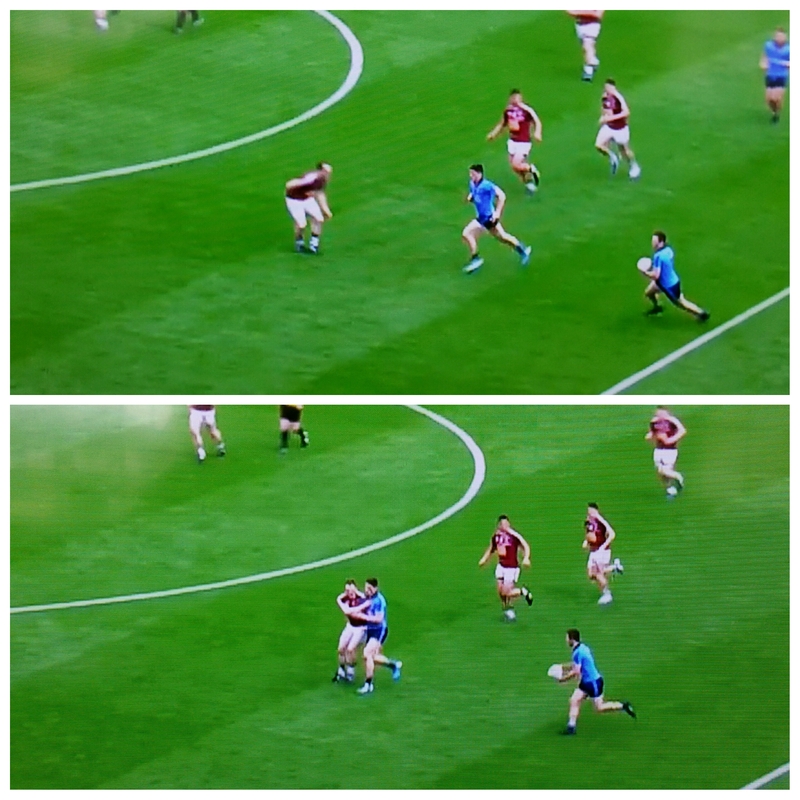 Some of the kick passing from Dublin was sublime, hitting forwards in stride and in space. The average number of shots from play for a team in 2012 was 20 … Dublin had 19 by half time. The main protagonists’ returns are listed below. Many a time on the blog I have indicated that the support cast behind Brogan wasn’t backing him up on a consistent basis. This game saw a mixed bag on this front with Andrews & Flynn having excellent games, Kilkenny & Mannion having relatively quiet shooting days whilst Connolly & Brogan’s returns were below average. Outside of Brogan the returns for the other 5 starters up front were a Success Rate of 52% (12/23) and a weighting of +1.843. Dublin will take that knowing Brogan can hit form at any stage. Connolly’s returns are somewhat skewed by the fact he had 3 attempts for a goal but didn’t convert any. For Dublin this may be the only real negative from the game; they had 5 shots for a goal but only converted 1. Again I’m sure the narrative internally is positive in the sense that they are making the chances but in tighter games these chances will have to be taken. Such a low weighting for a 100% return shows that all of Brogan’s frees were in the “easy” category. Heslin actually had quite a good day from deadballs after missing the first two but Westmeath desperately needed those initial scores. Interesting that anything Dublin hit, from either long or wide, was missed. They have the players to hit those shots in Connolly, Flynn & Brogan but it didn’t happen here. The usual tables re kickouts are attached. 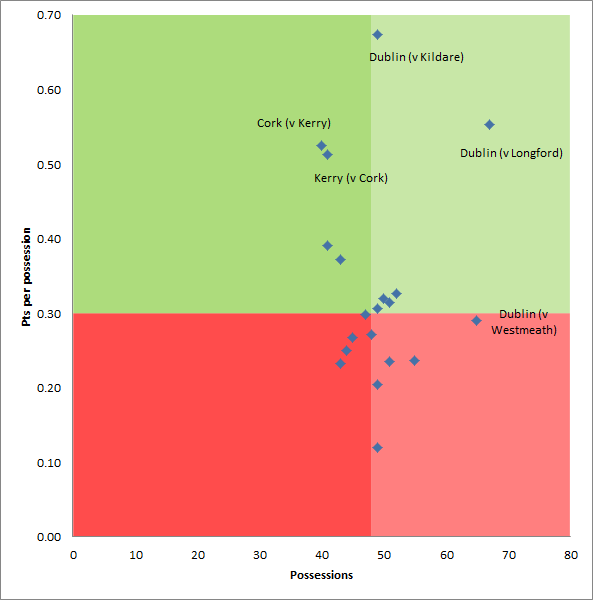 What may be of more interest, given the general discussion on the game and how Kildare approached this area the last time they played, is Dublin’s kickouts. 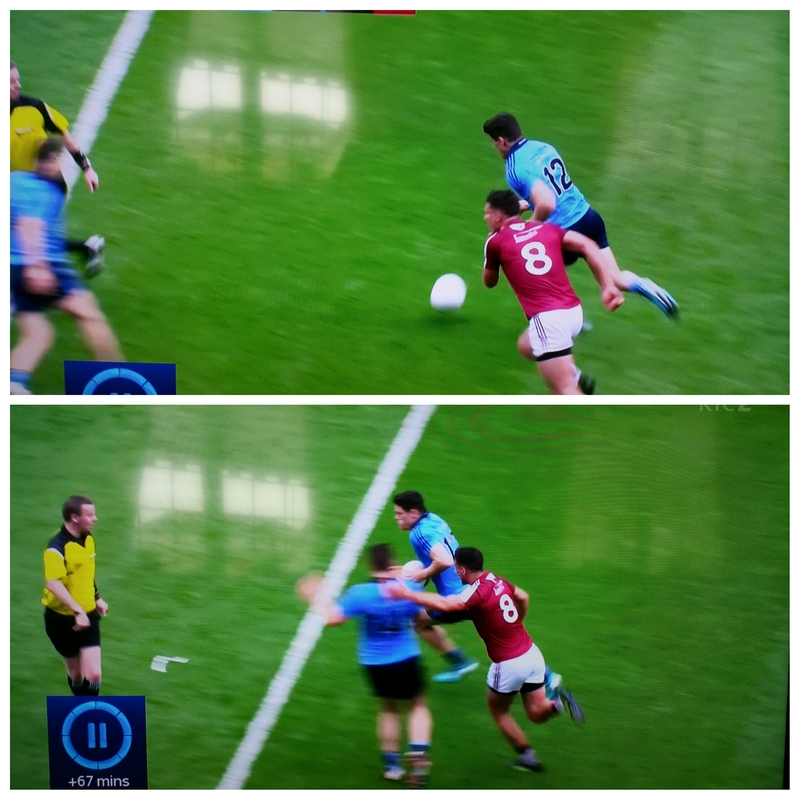 Westmeath dropped off allowing Dublin to have possession on short kick outs. Did it work? To a point. Dublin only got 0-01 from the possession that emanated from short kickouts as against 1-02 from kickouts that passed the 45m line. Dublin did get 4 shots from each though. There does appear to be merit, on very limited data, in trying this (letting Dublin have the short kickout) but will Kildare follow through after being so burned in the league? We’ve already touched on Connolly’s poor numbers. Glennon’s returns were also poor however every shot he took came under severe pressure and being their only real threat he probably felt he needed to take on the more marginal shots.